As a woman, I have no country. As a woman, my country is the world. Thinking and acting globally has many faces. Ideally, it includes creating an intercultural dialogue that fosters our shared responsibilities as citizens of this world. Women Beyond Borders, a cross-cultural art project founded with the goal of encouraging collaboration and community among women and honoring their creativity, has given new meaning to Woolf’s vision of female world citizenship. As this project has developed from a grassroots, local initiative to a savvy international art project, it has continued to challenge national, political, ethnic, religious, and aesthetic boundaries. Santa Barbara artist Lorraine Serena initiated Women Beyond Borders in 1991 with Elena Siff with the objective of reaching out to female artists worldwide. Eager to leave behind the isolation of her home studio, Serena began to ponder organizing a traveling exhibition of art made by women in order to forge international connections. Over the years, she held a series of gatherings of artists and art professionals in her studio to generate ideas for this traveling show. At one such meeting, a small souvenir box caught the attention of the group. They decided that such a box—evocative of a vessel, womb, tomb, gift, or shrine—provided a powerful symbol for women. It also could be shipped inexpensively and would offer artists an inspiring form for expressing their thoughts and feelings. Having found a suitable vehicle for their concept, the group prepared instructions for participants and hand-glued 200 boxes to be sent abroad. They contacted female curators and artists in 15 countries who were asked to invite 12 women in their home countries to participate. Each participant received an identical pine box with a lid, measuring 3.5” long x 2” wide x 2” high. As a result of the first outreach effort by Women Beyond Borders, about 185 boxes were submitted. They were exhibited for the first time at the Santa Barbara Contemporary Arts Forum in 1995. Since then, the project has drawn international attention and momentum. Hundreds of boxes have been added to the project from Europe, Africa, Canada, North and South America, Asia, and Australia. The participants range from accomplished artists to women with no prior artistic experience. They are asked to transform the simple boxes using paint, sculptural objects, photographs, text, or any other materials they deem fitting—not to exceed 12 inches in any direction or four pounds in weight. The completed artworks reflect a wide diversity of artistic styles and concerns, from abstract and strictly conceptual pieces to narrative and nostalgic works. Some boxes represent, on a small scale, the spectrum of trends in contemporary art, while others are inspired by the cultural traditions of their creators’ home countries. Despite the high level of individuality reflected in the boxes, it is interesting to note distinctive traits that connect a group of boxes from one country—for example, playful irony in the British, elegant simplicity in the Japanese, and folkloric colorfulness in the Mexican. In most cases, the meaning of the transformed boxes exceeds their modest size. Not only are they repositories for the artists’ individual expression, but many also reflect personal, political, and economic realities—as well as the hopes and joys experienced by women everywhere. The stated mission of Women Beyond Borders is to honor and document women’s voices and visions, to build community through dialogue and collaboration, and to inspire all women to express their creativity. The process of building community, which Founder and Artistic Director Lorraine Serena considers part of her artistic practice, lies at the heart of the project. Women Beyond Borders has become a catalyst for women’s art activities and cultural exchanges wherever the boxes are shown, as Serena and her small staff coordinate worldwide requests for exhibitions, solicit boxes from new countries, and communicate with curators and participants. However, this success is also owed to the determination of the many women worldwide involved in this project. Today, Women Beyond Borders has grown into an international art project involving over 1,000 participants in 37 countries, including several dozen curators and 700 established and emerging artists who have created box assemblages. Over 30 exhibitions plus special events in museums, galleries, and alternative venues on all continents have been organized, as well as numerous adjunct exhibitions, women’s support groups, panel discussions, and workshops for women, men, and children. Women Beyond Borders is not a simple exhibition—packed, shipped, installed, and opened—it comes with cultural baggage and a political imperative. The organizers took on diverse challenges, sometimes even personal risks, to meet that imperative. Each country hosting Women Beyond Borders developed a unique format and context for the boxes, depending on the availability of space and funding as well as the interests of the foreign curators. In Jerusalem, Israel, boxes were exhibited to coincide with an International Women’s Day celebration; in Basel, Switzerland, a selection of boxes was featured alongside a show of ancient Greek art entitled Pandora—Women in Classical Greece; in Oaxaca, Mexico, an exhibition of boxes was part of a program on women’s health issues. Boxes were taken in a suitcase by California women on a trek to rural Nepal to help educate the women there about health care, domestic violence, and human rights. Boxes were shown in settings as diverse as the National Museum of Kenya, the Wifredo Lam Center in Havana, a mall in Toronto, a restaurant in Zagreb, and Stansted Airport near London. Each exhibition proved to be an adventure as organizational obstacles, cultural differences, and national borders were overcome. For example, in 1996 a group of Austrian artists from Graz decided that an installation that could literally travel would be a fitting format to go with the theme of overcoming borders. The artists—Doris Jauk-Hinz, Veronika Dreier, and Eva Ursprung—rented a Russian sleeper and displayed the exhibition in cases installed between the sleeping berths, intending to convert the train car—a box itself—into a mobile sculpture. The exhibition was made accessible to the public en route from Graz to St. Petersburg via Vienna, Budapest, Lvov, and numerous towns in Lithuania, Latvia, Estonia, and Russia. However, as the train moved farther into Eastern territory, world views, values, and notions about “women,” “art,” and “nationality” changed rapidly. The artists accompanying the exhibition observed that the objective of fostering worldwide communication among women via small boxes became more questionable. They were challenged by puzzled viewers and unsympathetic border officials. Upon their arrival in St. Petersburg, they learned that the boxes would have to go into storage until a place and money to display them could be found. Four months later, the exhibition was finally shown at The Russian Museum. Afterwards, the boxes were secretly hand-carried out of the country in two suitcases to reach their next destination, The National Museum of Kenya in Nairobi, since the visa necessary to export them officially had been retained at one of the border crossings. The exhibition coordinators were not the only ones challenged when Women Beyond Borders traveled to its first Southeast Asian destination in spring 2001. Singapore curators Joyce Fan and Susie Wong took Women Beyond Borders to a more complex level. They invited local artists to create boxes based on an interrogation of individual identity in relation to a specific community they would engage with over several weeks—from as small as a family to as wide as the world. In response, a number of women explored their experiences as members of the many expatriate or minority sub-communities living in Singapore. Others entered into a dialogue with their religious or aboriginal communities, or gathered material from a group of women for their boxes (such as recipes, memories, remedies, or kitchen conversations). One artist enclosed statements written by Women Beyond Borders participants in her box—turned into a time capsule to be opened in 50 years. As the Women Beyond Borders project meets with growing interest, it is adapting to ever new and diverse contexts and audiences. With recent exhibitions at highly public spaces, such as the Ontario Airport near Los Angeles and the Olympic Games in Salt Lake City—and with its newly launched “daughter” projects, the international Children Beyond Borders and the California initiatives Youth Beyond Borders and GIRLS/Stepping Outside the Box—Women Beyond Borders has indeed become an international art project catering to mass audiences. From early on, Women Beyond Borders has fostered relationships with students from the elementary level through high school and college. In recent years, however, the project has opened up in particular to children and young women through workshops and adjunct exhibitions. When Women Beyond Borders toured Australia in 1999, one of the satellite exhibitions organized was Grrrls Beyond Borders. 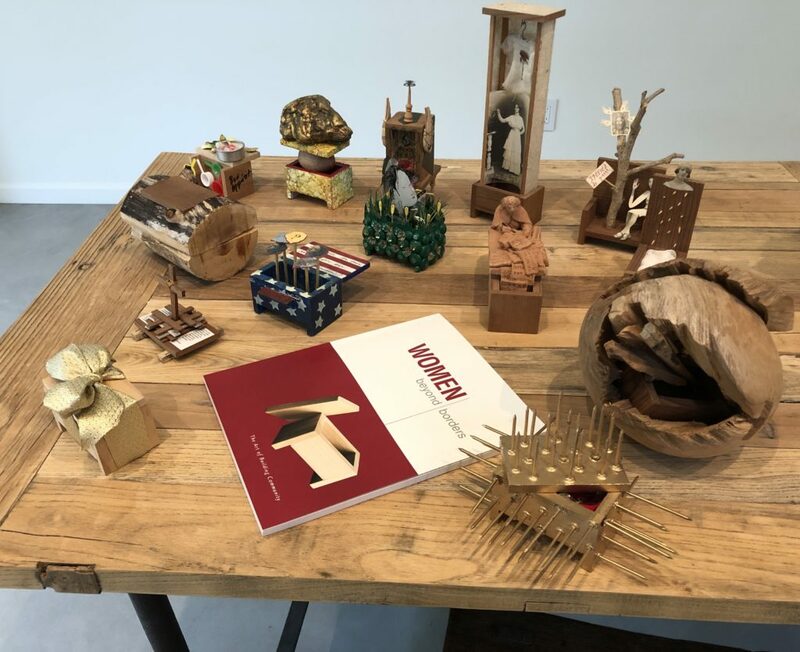 Over 200 boxes created by female high school students from Sydney were shown simultaneously with the international Women Beyond Borders boxes at Sydney University’s Tin Sheds Gallery. Most recently, a worldwide initiative called Children Beyond Borders was launched by Art Access Gallery in Salt Lake City in collaboration with the international organization Very Special Arts. This project involved several thousand children with disabilities from 33 states and 19 nations; their boxes were exhibited at the Cultural Olympiad in Salt Lake City in 2002 as well as in their respective states and nations. The Women Beyond Borders project is positioned at a crucial intersection in today’s art. While the inspiration for Women Beyond Borders is rooted in the history of U.S. feminist art and politics of the past three decades, the project’s concept and vision are pointing to an increasingly globalized, multicultural, and digitally connected future. The founders of Women Beyond Borders have been hesitant to label their work feminist. However, the feminist and women artists’ movements emerging in the late 1960s in the United States and Europe can be considered a crucial inspiration for the project. In particular, project founder Lorraine Serena was inspired by a workshop titled Making Art As If the World Mattered, taught by well-known feminist artist Suzanne Lacy and art theorist Suzi Gablik. The form and content of Women Beyond Borders take up many of the criticisms the women artists’ movement has leveled at established art practice since the early 1970s. One of the fundamental issues taken on by that movement was to question dominant notions of art, genius, and greatness in art, which in the past have functioned to exclude women from art training and acknowledgment in art historical publications. With its striving for inclusiveness, Women Beyond Borders has raised fundamental questions about what is considered art and who can be considered an artist. The process of building community, which Serena considers part of her artistic practice, lies at the heart of the project. While Women Beyond Borders rests on the creation and exhibition of actual art objects—the boxes—the project’s uniqueness lies in the network its founders have built together with supporters all over the world. With its goal to connect women, the Women Beyond Borders project has followed a tradition in feminist art making since the early 1970s. Historically, feminist community building originated with the consciousness-raising process, in which women gathered to share deeper concerns about their lives. On the West Coast, for example, artists Judy Chicago and Miriam Shapiro integrated the concept of consciousness-raising into their path-breaking feminist art education programs. The emphasis on community building has continued to be explored in artworks by many feminist artists. Chicago embarked on a large-scale artwork from 1974-1979, The Dinner Party, consisting of a monumental triangular dinner table elaborately set for 39 women from the mythic beginnings to the present. The artist worked locally with over 400 volunteer collaborators who created, among other things, the exquisitely crafted table runners. She also reached out to women internationally with a quilting bee. Supporters of Chicago’s project contributed triangular-shaped commemorative quilts for women of their choice that were exhibited along with Chicago’s dinner table. Further, Lacy, who had been a student of Chicago and Shapiro, organized an event designed for the opening of The Dinner Party at the San Francisco Museum of Modern Art in March 1979, which she entitled The International Dinner Party. She sent over 1,200 invitations to women all over the globe asking them to come together for ritual dinner parties, which they would dedicate to women or women’s causes they chose. Lacy conceived this 24-hour event as a performance through which the contemporary lives and loving connections of women around the world would find expression, and asked the diners to send telegrams or cables to the project’s office, where she indicated on a large wall map the places where the dinner parties took place. Future exhibitions on several continents of The Dinner Party itself sparked grassroots organizing as well as women’s events, from informal discussion groups to elaborate galas. As mentioned above, the work of Lacy in particular served as an inspiration for the founder of Women Beyond Borders. Lacy, one of the most prominent artists committed to large-scale community projects, developed several public performances involving large groups of women. In her activist performance In Mourning and in Rage of 1977, a group of Los Angeles women commemorated the victims of the infamous Hillside Strangler on the steps of City Hall. More recently, Lacy’s 1987 Mother’s Day performance Crystal Quilt involved 420 older women sitting around tables in groups of four in downtown Minneapolis, discussing their concerns. While many of the feminist art projects described above were concerned with a more immediate notion of community and togetherness, Women Beyond Borders has relied on and conceptually integrated international communicative networks such as the postal service (for sending the boxes; small for inexpensive shipping) and the Internet (for communication among the participants and coordinators). The building of community through art by using international communicative networks has its predecessor in the mail or correspondence art that emerged in the 1960s. Postal art activities were practiced by members of the international Fluxus group and by the New York Correspondence School. The group’s name was a word play on the then-popular New York School of Abstract Expressionists, which relied on large formats and wealthy dealers. Mail artists, in contrast, considered the distribution of small, inexpensive items via the postal service a more democratic form of exchange. In the 1970s, female artists already took advantage of these networks. A women’s postal art event called Feministo, for example, was initiated in Great Britain in 1975. Artists Sally Gallop of the Isle of Wight and Kate Walker of London sent small artworks back and forth that expressed their feelings of being confined by childcare and domestic responsibilities. As more women from England, Scotland, and Germany became involved, Feministo functioned as a lifeline for artists who felt trapped in their homes as mothers and housewives. It became a living process, a dialogue among its participants, with occasional exhibitions of the small artworks entitled Portrait of the Artist as Housewife. Throughout the 1980s, many mail artists became networkers who pursued the intercultural transformation of information within a new global network— the Internet—carrying along with them the idealistic, democratic values of former postal art communities. Mail art found a parallel world online, and electronic mail artists established local as well as global networks. Early on, feminist activists and artists discovered the Internet as a new tool with both subversive and supportive potential for women. Although access to computers and the Internet is still limited, the Internet can be particularly important for geographically and socially isolated women who would not have access to empowering information and supportive environments otherwise. Many international cyber-feminist networks and informative sites concerning women have emerged, filling Woolf’s quote with an up-to-date dimension. New achievements in communication technology have been crucial to the development and success of Women Beyond Borders. Indeed, teaching women to communicate via the Internet has been an intrinsic aspect of the project from the beginning. Digital artist and Women Beyond Borders participant Victoria Vesna established the Internet link f-e-mail and beyond, designed to assist women in becoming knowledgeable about digital technology as a communicative tool. Further, in order to make the project more widely accessible, Santa Barbara artist Sky Bergman created a website with images of the boxes, exhibition dates, links to related projects, and other information about Women Beyond borders. In order to expand access, websites about Women Beyond Borders exhibitions and related projects abroad have been created by the Austrian, Japanese, and Australian project coordinators. Taking advantage of modern technology and a general movement towards globalization, the project has successfully transcended borders of all kinds and built a community of women, who, through their involvement with this project, have become advocates for women’s creative visions and social change. Women Beyond Borders has developed into one of the most intriguing and inspiring cultural phenomena at the arrival of the 21st century. While the shape of the box may symbolize containment to some, and was critically approached by several participants, its broader framework challenges existing norms and limits.